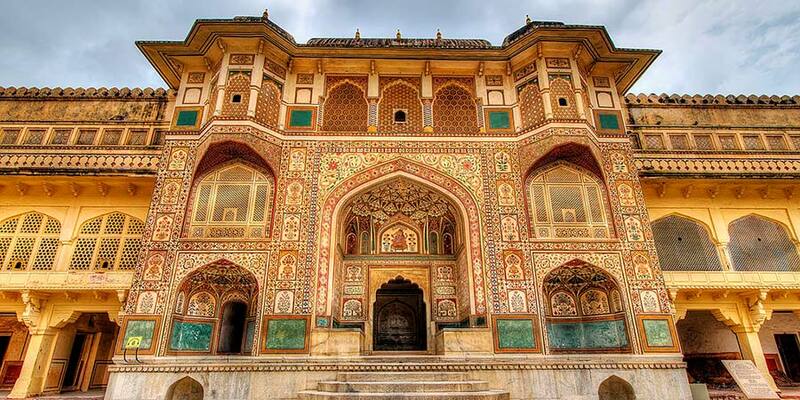 Ganesh Pol in Amer Fort, constructed 1611 and 1667 by King Jai Singh II is located in the main palace of the Amber Fort. There are total seven main gates like Ganesh Pol in the Amber Fort but Ganesh Pol has most importance among all due to its unmatched architecture and strategic location. As the name suggest, Ganesh Pol has a magnificent idol of the Hindu Lord Ganesh which is splendidly coloured in different colours. Ganesh Pol at Amber Fort is also strategically important as entry through this gate was exclusive to the Kings and their families so that they could easily get inside the fort, into their private chambers without being disturbed. Ganesh Pol is architecturally significant as it represents the fantastic fusion of the Mughal and the Rajput style of architecture. Ganesh Pol leads to scenic lawns of Mughal Garden in Amber Palace. By Road: Ganesh Pol is located near the Jaipur city, in the Amer Palace. Nearest bus stand is Amer Fort bus stand and one can easily reach here with a local taxi or cab from Jaipur. By Rail: Ganesh Pol, Jaipur is well connected through Jaipur Railway station to major cities railway stations like Delhi, Agra, Mumbai ,Chennai, Bikaner, Jodhpur, Udaipur, Ahmedabad. By Air: Ganesh Pol can be reached through Jaipur Airport, also called Sanganer Airport which is well connected with regular domestic flights to Delhi, Kolkata, Mumbai, Ahmedabad, Jodhpur, and Udaipur.